In this modern age, the power held by social media is not something to be underestimated – it is a place where everything you say can be read, judged, documented and have massive implications on your personal life within a matter of hours. Okay yeah that sounded a bit like a doomsday prophecy, but the ramifications of posting on social media can be catastrophic, resulting in people having to change their names, move countries, and get new jobs; and a lot of these results come from when people don’t think before posting. Here are 15 times, varying from funny to just horrific, that people posted to social media without thinking… well, at all really. This is just a textbook 21st century mistake. Mr. Bartosiewicz accidentally sent his tweet about Detroit drivers to his work twitter account, when he worked for Chrysler! I say ‘when’ ’cause as you can imagine this didn’t go down well. 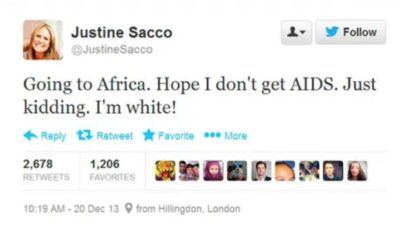 When Justine Sacco tweeted this horrifically racist tweet she probably didn’t realise that it would become one of the most heavily talked about social media posts ever. The tweet garnered such attention that #hasjustinelandedyet was trending on Twitter. Justine was fired from her position as communications director of New York-based internet empire ‘InterActive Corp’ almost immediately upon landing and became something of a reference point for the topic of ‘Online Shaming’.